This is Jeff Lindsay's first book introducing the serial killer Dexter - a blood spatter expert who only kills those who fit 'the code' taught to him by Harry, his adoptive father. As we know, the books have been made into the well known US TV series called Dexter and I've enjoyed watching all the seasons to date. So, when I decided to read the first book, I wasn't sure what to expect. It was quite a shock to find that series one of the TV show follows the book so closely. On several occasions I found myself chuckling while reading the character descriptions of Deb, Doakes and Masuka. They're exactly like that on the big screen! In fact, this is the closest book-to-screen adaptation I can think of. So much so, that it became a little predictable in parts, so I was in for a swift shock at the end of the book when one of the key characters dies in an ending that couldn't be further from the TV show. 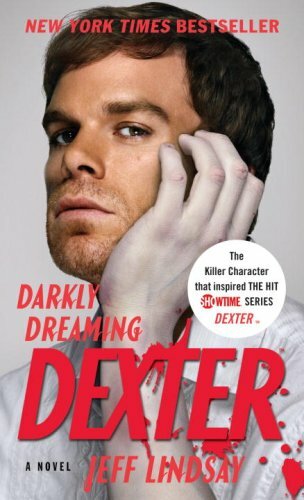 All in all, I enjoyed reading Darkly Dreaming Dexter and I can safely say that Michael C. Hall has been cast exceptionally well, playing the role of Dexter on the show. I could really hear his voice in the book, and it easily carried me along. I have the next two to read in the series, however, they're going to have to wait a while - I have 45 books on my TBR (to be read) pile at the moment. Unfortunately, this wasn't good enough for the next two to jump to the top of the pile, but I'll enjoy coming back to Jeff Lindsay's characters when I can.